Hank’s handy, frugal paint holder makes painting projects more enjoyable. Joan, an honorary Fiercely Frugal Savage Sister, recently gave us a great idea for do-it-yourself painters. 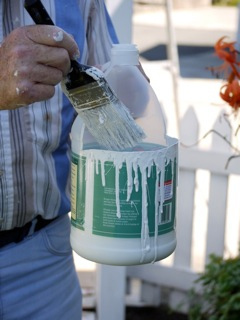 Husband Hank set out to touch up the fence, but the full gallon of paint was too heavy and awkward for him to manage. He and Joan looked around for a smaller container but could find nothing suitable. Joan handed him an empty milk jug with the suggestion that Hank could cut part of it away, leaving the handle for easy grasping. The idea was clever, but the milk jug was too flimsy. Hank searched for another type of jug and came up with an empty vinegar bottle. He cut part of the top off, leaving the handle, and voila!–a terrific paint container he could hold onto with one hand. The best part was no cleanup. When he was finished with the fence, he simply poured all the unused paint back into the can and threw the jug away. When you’re done using this tip on your own painting project, be sure to visit Joan’s blog and relax with her evocative posts about nature, travel, and growing up in the woods of Washington State. Read more about Joan at http://www.RainsongPress.com. This entry was posted in Resourceful Recycling and tagged containers, creative solutions, recycling. Bookmark the permalink.